The intention in this chapter is to determine whether or not we can support Lewis-Williams and Dowson's claim that entoptic images were the result of drug-induced trance states. To do this we must first establish the worldwide availability to past populations of hallucinogenic drugs. One of the main aims is to determine to what extent one can accept the view that drug-induced trance states would have been an integral part of the life of Palaeolithic, Mesolithic and Neolithic peoples. In order to establish the possibility of such an occurrence, one must first examine the data available to support the idea that hallucinogenic substances would have been available in the first instance during the aforementioned periods. We would wish therefore to examine the evidence for: the different forms of narcotics which would have been available, where they would have been found, grown, or cultivated, and any evidence that past cultural groups made use of their narcotic qualities. Evidence from the period under examination is scanty, the majority of information will come from pottery forms and the written record from subsequent periods. Following this, we must produce evidence that these drugs do in fact produce trance states in which entoptic phenomena were 'seen'. It will become apparent that the majority of the evidence comes from the New World. This, I would suggest, is because of the great variety of species found there and because the ritual taking of some forms still occurs today, to a degree untouched by modern civilisations. Definition of Hallucinogens: "nonaddictive narcotics that apparently act on the mental processes in such a way as to induce temporary 'altered states of consciousness'"
As Furst (1972:vii) notes, the legal restrictions put on the use of drugs has led to the restriction of genuine research into these substances and their effects. He goes on to say that these potent substances, whether generated synthetically like LSD or naturally occurring ones such as morning-glory (similar to LSD in its active principles), have potential for good and evil. Their effect depends as much on who takes them, in what context, for what purposes, and under what kinds of control, as it does on the drugs themselves. It must be stressed that hallucinatory and psychoactive drugs have been a part of human culture and religion the world over, from the distant past right through to the present day, and this cannot be ignored. For example the peoples of Middle and South America have made use of nearly one hundred different botanical species for their psychoactive properties, a total which excludes the scores of plants used in the brewing of alcohol to induce ritual intoxication. So far the work of La Barre (1972) indicates that the practice of shamanism and the ritual taking of hallucinogens may be plotted as far back as fifteen to twenty thousand years. Furst (1972:ix) further notes that "the striking similarities between the basic premises and motifs of shamanism the world over suggest great antiquity as well as the universality of the creative unconscious of the human psyche" . He gives a brief introduction to the study of narcotics which then leads into the more specific chapters. The first, and probably one of the most useful for this study, is by Schultes (1972) on the Hallucinogens of the Western Hemisphere. He lists in detail the main categories of hallucinogens which occur in North, Central and especially South America (Furst 1972:vii-xvi). According to Schultes (1972), there would have been many more plants available for the purpose of generating hallucinations than were ever utilised by our ancestors. Psychoactive species are spread widely through the plant kingdom, yet it was the fungi and the angiosperms which were predominantly employed. Bacteria, algae, lichens, bryophytes, ferns, and gymnosperms have generally been ignored. Schultes (1972:6) points out that for some reason the New World appears to have employed many more species of hallucinogens than the Old World. He goes on to say that there are no indications that the flora of either area was richer or poorer than the other. La Barre (1972:261-278) attempts to explain this phenomena by suggesting that in the New World shamanistic religion was kept alive for a longer period of time by means of hallucinogenic drug taking, and that it survived even when the changes from hunters to agriculturalists to civilised society occurred. On the other hand, in the Old World he asserts that the shamanistic beliefs and use of hallucinogens waned with the introduction of agriculture and the introduction of new religious systems. Sherratt (1991) indicates that sensory-altering substances would have played a powerful role in Neolithic Europe, and that there would have been an "extensive knowledge of the various mood-altering substances" which were available in the natural flora and which survive today in the attenuated form of 'herbal remedies'. A greater variety of plants with stimulating and aromatic properties would have occurred in the Mediterranean and sub-tropical as opposed to Temperate Europe. "There was thus considerable potential for the spread of even mild stimulants, and of methods of preparation which enhanced their effectiveness" (Sherratt 1991:51). Sherratt believes that the ritual behaviour of body painting, using ornaments and special clothing, is especially enhanced by changes in mood or metabolism. He therefore points to the importance of plants with psychoactive properties. He goes on to say that the quantity of the stimulant need not be large, as it may be enhanced by fasting or breathing control. Such experiences are likely to be deliberately sought in the course of a ceremony or religious ritual, and at that time perhaps seen as a means of accessing other worlds. Sherratt would argue that these 'shamanistic' rites may even go back to an early phase of prehistory. He points out that the written record gives many accounts of such usage of drugs. He mentions the ritual use of Nymphaea caerula used as part of the Osiris cult in Dynastic Egypt; the use of coca leaves by the Incas; the use of hallucinogenic mushrooms by the Aztecs; the use of the drink Rig Veda by the Aryans; and the inhaling of Cannabis smoke by the Scythians (Emboden 1979). Sherratt states that any account of prehistoric Europe which omits the mention of such substances is sure to be incomplete. He goes on to note some concrete evidence for drug use: (1) the Peyote Cult, which continued into the Historic period in North America; (2) tobacco which is an older example of a widespread New World Narcotic (c.f. Hopewell stone smoking pipes) (Sherratt, 1991:54); (3) Russian kurilnitsa ('pipe-cup') and the eastern European polypod bowls or braziers, which begin in the Pontic steppe region in the lower Mihailovka culture. This corresponds to Sredni Stog II and further west to later Tripolye and to Bodrogkerestur, in the long period from 3200-2800 BC (ie c. 4000-3600 cal.BC). Sherratt has put forward a link between corded ornament and the use of Cannabis as a fibre-plant and potentially as a narcotic (Sherratt, 1991:61-62). La Barre notes that it is likely that hunter-gatherer societies would have been under more pressure to experiment with potential foodstuffs than their agriculturalist descendants. But, to what extent were hunter-gatherers seeking out new resources, and what evidence is there to suggest that they were more likely to require subsidiary foodstuffs than agriculturalists? It is in turn likely that they uncovered an array of narcotic substances in their search for food, (La Barre 1970:73). This contradicts Schultes' view that the hunter-gatherers knowledge of narcotics would be no greater than his civilised counterparts (Schultes 1966, as cited by La Barre 1970:73). "Only four or five narcotic cultigens are commercially important; and they are unknown in the wild state, indicating long association with man" (La Barre 1970:74). One must constantly bear in mind when studying an area such as ancient narcotics, that ancient plant material survives by one of three methods: by carbonisation, by waterlogging, or by dessication (Renfrew, J. 1973:8). For convenience, I have compiled a list of the major hallucinogens below, with information about growing habits and their usage. The three major forms are at the beginning; opium, hemp and mushrooms are not restricted in their growth patterns and usage to the New World. A further list of minor hallucinogenic plants can be found in appendix I. The first category of hallucinogen to be discussed is opium. The opium poppy is an annual herb that is widely cultivated in several temperate and sub-tropical regions of the world, and is the source of a powerful narcotic drug (Merlin 1984:17). The effects of opium can differ dramatically. It can induce mild euphoria and pleasant hallucination, but it can also activate "illusionary perceptions of a frightening nature" . Merlin (1984) attributes this in part to the contradictory qualities of the various alkaloids which the opium poppy produces. The opium poppy has more than thirty alkaloids, of which morphine and codeine are used for medical purposes; narceine is hypnotic; thebaine, papaverine and narcotine are similar to strychnine; and the narcotic substances heroin and diamorphine are toxic and extremely habit-forming (Renfrew, J. 1973:161-2). The seeds of Papaver somniferum contain no opium. The opium is derived from the latex in the unripe capsules (Renfrew, J. 1973:161-2). "The earliest drug use of the opium poppy may vary well even reach back past the Greeks into the early Neolithic, Mesolithic or Upper Palaeolithic periods of cultural evolution: "Mankind has always been engaged in a search for greater comfort, and high priority has been granted to the development of drugs to relieve pain" (Cohen 1969:76). We can be sure that man has suffered from 'hurtful influences' from the very beginnings of his existence" (Merlin 1984:96). "The opium poppy has been cultivated since neolithic times, perhaps in the first place for poppy-seed oil, but who can doubt that its narcotic property enhanced its value" (Dimbleby 1967:70). The opium poppy is native to the European flora, and thought to have a southern Mediterranean distribution. The general view is that the opium poppy was domesticated in the West Mediterranean, perhaps as early as Impressed Ware times, and spread from there to other parts of Europe (Sherratt 1991:52). Evidence for opium found at Cueva de los Murcialagos ('Bat Cave') has been radio carbon dated to c. 4200 BC. Large number of burials were found to be accompanied by globular bags of esparto grass containing a variety of items including large numbers of opium poppy capsules. This suggested that the seeds had a symbolic significance beyond their use as a food source, and that this symbolism was particularly appropriate as an accompaniment for the dead (Sherratt 1991:52). Poppy seeds were identified as early as 1878 among material from the Swiss Neolithic lake villages, and more recently from the Bandkeramik sites in the Rhineland. Complete seedheads, important for the identification of domestic varieties, have been recovered from lakeside sites and arid caves. (Sherratt 1991:52). The prehistoric lake-side villages of Switzerland have yielded the most numerous finds of Papaver somniferum (opium poppy) capsules and seeds. There are seventeen finds from Neolithic contexts, mainly from Switzerland, but with some from south-west Germany, north Italy and from Murcielagos Cave in Spain, which have been listed by Bertsch and Bertsch (1949:198, as cited by Renfrew J. 1973). Bertsch and Bertsch also list ten finds of the Bronze Age in Switzerland. Seeds of Papaver setigerum have been found at five Bandkeramik settlements in Germany (Oekoven, Aldenhoven, Lamersdorf, Garsdorf and Langweiler) (Kn�rzer 1971:34, as cited by Renfrew J. 1973). Evidence of Papaver somniferum has been found at Langweiler and Wickrath in Iron Age contexts, (Renfrew, J. 1973:161). Papaver somniferum was also found in an Iron Age context at Fifield Bavant in southern England and Biskupin, Poland during the Hallstatt period (Renfrew, J. 1973:161). including mexicana, americana (gigantea) and indica. In his article on the ritual use of Cannabis, Emboden (1972:214, in Furst 1972) stated that there is evidence to suggest that it has undergone natural selection, and selection by man, for perhaps 6,000 years. North American and Mexican varieties can grow up to twenty feet; the Indian variety is smaller but has more potent resin. Wild Cannabis sativa was recently identified in botanical survey of Northeast Hungary (Chapman, J.C. 1994, personal communication). Cannabis has been found to be both annual and perennial in nature. "Hemp (Cannabis sativa) has a similar history [to the opium poppy]. It is valuable not only for fibre and oil-seed, but as a source of hashish or marijuana. Although a plant of warmer climates, it does grow under British conditions and indeed was a compulsory crop in Tudor times" (Dimbleby 1967:70). He goes on to say that the growing of hemp was enforced by law, due, he believes to the British climate, as hemp only produced significant amounts of the narcotic alkaloid in exceptionally hot and dry summers (Dimbleby 1967:70). The dried flower tops of Cannabis can, as in the case of Papaver somniferum, be used for medicinal purposes, as they possess sedative, analgesic and narcotic properties (Renfrew, J. 1973:163). Hemp seeds (Cannabis sativa) have been found in several Neolithic sites. This implies that these plants also have had a long history of cultivation (Zhimin 1969:647). The range of species of cultivated plants found in the Linearbandkeramik Culture of the Dniester-Prut region in the Middle Neolithic included the finding of seeds of hemp (Cannabis sativa), a plant of supposedly central Asian or even Chinese origin (Yanushevich 1969:611). According to Sherratt, Cannabis has an eastern.and Steppe distribution, and both hemp and opium poppies were grown and utilised in Neolithic times. "Early literary and iconic references indicate that it was often used in religious contexts in the first and also the second millennium BC" (Sherratt 1991:52). In the case of hemp (Cannabis sativa), significant amounts of data have been retrieved from Europe. The earliest find of hemp seeds is from the Bandkeramik site at Eisenberg, Thuringia, Germany. Neolithic finds come from Thayngen Weier in Switzerland, Voslau in Lower Austria, and from Frumusica in Roumania (Willerding 1970:358). Evidence supports the view that Cannabis was in use during and after the Iron Age, from western Europe to China. Such evidence includes the abundant finds from the Hochdorf Hallstatt D waggon-burial; from Herodotus' famous account of the Scythians (accuracy confirmed by a deposit of hemp seeds in Barrow 2 of the Scythian tombs at Pazyryk in the Altai mountains of Siberia [Renfrew, J. 1973:9]); and references in Han medical texts (Sherratt 1991:52). Earlier usage has been established for the early third millennium in Eastern Europe. This evidence includes the material from the Pit-grave (Kurgan) burial of the later third millennium BC at Gurbanesti near Bucharest in Romania. Here, a pipe-cup was discovered containing charred remains of hemp-seeds accompanying one of the burials in the Tumulus. In a second contemporary burial, part of the north Caucasian Early Bronze Age, a similar pipe-cup with hemp-seeds in it has been recorded. Both these finds tie in with the botanical data relating the distribution of Cannabis sativa to the steppe, and its spread from this region as a cultivated plant into Europe and China (Sherratt 1991:53). As Sherratt points out, in both the cases stated above Cannabis was known to early farmers in Europe, and some familiarity with their narcotic properties may be presumed (Sherratt 1991:53). Sherratt also notes that, in Neolithic times, even weak varieties of narcotics would have been appreciated and that stronger narcotics would probably have evolved later. It is possible that when other psychoactive substances such as alcohol came into use, the earlier varieties were displaced, and that their usage has since been forgotten as they did not develop into more potent varieties (Sherratt 1991:53). Sinskaja notes: "from a study of hemp (Cannabis sativa) showed that weed hemp, just as cultivated hemp, required a very richly fertilised soil and that it was always to be found around the camps of the nomads in the Altai where the soil had been enriched by cattle during the winter, as well as in kitchen gardens and in rubbish heaps. She drew attention to the wide variation of wild hemp, which followed man's wanderings through the Old World, postulating that in times of famine man selected for use the forms with less shattering fruits and higher oil content. Sinskaja pointed out that in the Altai, one could see all the details of hemp cultivation and she postulated that the following four stages, which can now be seen simultaneously, followed each other chronologically when hemp was first cultivated. (1) The plant occurred only in the wild. (2) It spread from its original wild centres to populated places. (3) Hemp then began to be utilised by the population. (4) It was finally cultivated" (Sinskaja, as cited by Hawkes 1969:19). a. China: there is evidence that the Chinese were aware of the narcotic and medicinal uses of Cannabis. Emperor Shen-Nung compiled in 2737 B.C. (allegedly) a pharmacopia where he recognises both male and female plants, and shows a distinct bias toward the female plant which produces significantly more intoxicating resin. In the Chinese book the Rh-Ya, which was compiled in the fifteenth century B.C., there is reference to the herb Ma, the Cannabis sativa plant, and describes the first ritualistic or shamanistic use of the plant. However, the most detailed account of its uses is given by the Shu-King written in 500 B.C. (Emboden 1972:216). b. Ancient Mediterranean: Emboden notes the classic Greek term cannabeizein, which means to smoke Cannabis. Democritus (ca. 460 B.C.) knew Cannabis as potamaugis, (might this have lead to the term 'pot'?) which he said was drunk with wine and myrrh to produce delirium and visionary states. Theophrastus (371 - 287 B.C. ), the first Greek botanist, knew Cannabis as dendromalache and gave one of the first accurate accounts of the plant. The Roman writer Lucilius in ca. 100 B.C. said that the plant was so like hemp-agrimony that it was termed the cultivated hemp-agrimony (Emboden 1972:218). c. Arabia: Hashish got its name from al-Hasan ibn-al-Sabbah (A.D. 1124), but only the sketchiest biographical data has survived. Some say he was Persian by birth and that he came from Tus (Emboden 1972:220). d. Asia Minor: The use of Cannabis by the ancient Scythians in their funeral practices appears to have been adopted from the Thracian Getae who briefly dominated them in the early sixth century B.C. The Getae were a well-organised society of horsemen and hunters; their shamans were known as Kapnobatai and they used hemp smoke to induce visions and oracular trances. Traces of hemp were discovered in a Scythian funeral urn, and it is thought that they were using hemp at least as early as the fifth century B.C.. De Candolle (1869, as cited by Emboden 1972) suggests that the Scythians were disseminating Cannabis to other areas around 500 B.C. (Emboden 1972:222-224). e. India: According to Emboden, Cannabis was not indigenous to India, and it is most likely that it arrived via a migration route from Iran. Already in use by the Indians were Rauwolfia serpentina and Withania somnifera. Emboden believes that because these were already in use it made the assimilation of Cannabis easier (Emboden 1972:224-225). f. Africa: It is believed that Cannabis entered Africa from either India or Saudi Arabia, the exact route is unknown. It appears to have been in the Valley of the Zambezi by A.D. 1500 (Emboden 1972:225-227). g. Europe: Emboden (1972:227) states that Cannabis must have been available in Europe since relatively early times, but that little interest was shown in it until ca. 1800, when "Napoleon's battered army returned to France from the Egyptian campaign with hemp resins to sustain them" (Emboden 1972:227-229). h. Mexico: It appears that although Cannabis was unknown in the New World until the Conquest, it has come to replace some of the native hallucinogens which have become hard to find (Emboden 1972:229). Emboden (1972:234), concludes that the evidence suggests that Cannabis may have been gathered for use, if not cultivated, by the Late Neolithic; and that, with the exception of Egypt, it was one of the most prominent cultigens in the Bronze and Iron Ages. includes Conocybe, Panaeolus, Psilocybe and Stropharia. Brothwell and Brothwell (1969:85), devote a chapter to fungi. They primarily research it from the viewpoint of a foodstuff, but they do include a brief account of its other properties. On a general basis, they note that the number of true species of fungi has been put at a little under 40,000, and note that it seems likely that at least some of these would have been eaten by early humans on a regular basis. Fungi "occur in all kinds of places and at almost all times of the year" . During June to November, there is a more prolific array of fungi to be found in Europe, with spring being the next most productive season, (Brothwell and Brothwell 1969: 85-6). It also appears that fungi are hard to get rid of. Brothwell and Brothwell (1969:87) point out that the change in the methods of food procurement from Upper Palaeolithic gathering to the Neolithic methods of burning and clearing of forests, would not generally have diminished mushrooms. It appears to be the case that, the new ecosystem would have become home to a whole range of new species wider than had been supported by the forest. However, there would probably have been an increase in grassland fungi at the expense of the woodland varieties. They also note that there may have, in fact, been an increase in those species which thrive on burnt areas. Moving on to the narcotic properties of mushrooms, Brothwell and Brothwell (1969: 88) think it highly unlikely that mushrooms were not, in some instances, used specifically for their poisonous or intoxicating properties. For example, the Koryak tribes of the Kamchatka use Fly Agaric as a stimulant (Dimbleby 1967:70), as do the Dyaks of Borneo and other varieties of mushroom have been used by the native inhabitants of New Guinea. Amanita muscaria or fly agaric mushroom date back at least 7000 years spreading from Siberia to India by the 2nd millennium B.C. (Furst 1972:ix). There was use of hallucinogenic fungi, or 'teonanacatl', amongst the early Mexican populations, and this is still in use in some villages today. 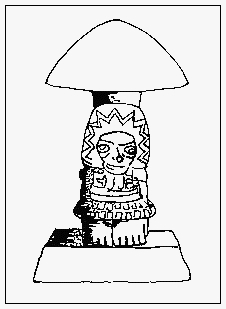 In Mexico certain stone effigies which are thought to date back to 1000 BC are known as mushroom stones (Brothwell and Brothwell 1969:89), and have been put forward to support the theory of early mushroom use in Mexico (Brothwell and Brothwell 1969:88). 'Mushroom stones' have been unearthed in considerable numbers from Late Formative sites in highland Guatemala and southeastern Mexico, see Figure 2 opposite, (after Brothwell and Brothwell 1969:89, fig. 27). These mushrooms were of great importance to Mexican religion and life. Indeed, today there is still evidence of usage by at least nine native Mexican tribes; interestingly in their ritual ceremonies the shaman is often a woman. Brothwell and Brothwell also suggest that the existence of mushroom cults indicates that these people had been able to distinguish the various kinds of mushroom for many centuries (Brothwell and Brothwell 1969: 88). Brothwell and Brothwell conclude that whatever may be believed "about their nutritional value to prehistoric man, it is an undisputed fact that fungi were well known and used by various peoples throughout recorded history (Brothwell and Brothwell 1969: 90). includes Ariocarpus, Epithelantha, Lophophora, Neoraimondia, Pachycereus and Trichocereus. The most important species of the cactus family is the Peyote Cactus (Lophophora Williamsii ). The Peyote Cactus was fully described for the first time in 1651 by Hernandez who called it Peyotl zacatecensis; and the first botanical illustration called Echinocactus Williamsii was in the Botanical Magazine in 1847. It has been suggested by Sahagin that the Toltecs and Chichimecas had employed this for many hundreds of years for its 'magical' and medicinal uses. The Peyote religion managed to survive in pure form in the more remote deserts and mountains, despite the attempts of the early Spanish invaders to quell pagan religions. In other areas it became intertwined with Christian ritual and belief. The effects of the Peyote Cactus are characterised by "brilliantly colour visions in kaleidoscopic movement, often accompanied by auditory, gustatory, olfactory and tactile hallucinations. Sensations of weightlessness, macroscopia, depersonalisation, and alteration or loss of time perception" (Schultes in Furst 1972). "a period of contentment and hypersensitivity followed by calm and muscular sluggishness, often accompanied by hypercerebrality and coloured visions. Before visual hallucinations appear, usually within three hours after ingestion of the drug, the subject sees flashes of colour across the field of vision, the depth and saturation of the colours (which always precede the visions) defying description. There seems to be a sequence frequently followed in the visions: from geometric figures to familiar scenes and faces to unfamiliar scenes and faces and in some cases objects" (Schultes in Furst 1972). Other types of hallucinogenic cactus are also utilised, for example the tall columnar cactus plants, found growing in the Andes, which also contain the alkaloid mescaline, as does the peyote. Not only are these cacti eaten, but some varieties such as the Trichocereus Pachanoi are made into a hallucinogenic drink known locally as San Pedro. Another intoxicating drink is also made with T. Pachanoi also containing other ingredients such as Neoraimonda macrostibas (a tall columnar cactus), Isotoma longiflora (Campanulaceae), Pedilanthus titimoloides (Euphorbiaceae), and a species of Datura (Solanaceae). Many of these ingredients are in themselves alkaloidal and may contain their own hallucinogenic elements. including Anadenanthera, Mimosa, and Sophora. This family of plants is one of the richest in alkaloids and it is surprising that not more of its species has been utilised. Anadenanthera peregrina or Piptadenia peregrina is the source of the New World's most famous hallucinogen which is in the form of snuff. The centre of this snuff's usage is the Orinoco basin, and this is where it probably originated. Here it is known as yopo. Sophora secundiflora, more commonly known as the mescal bean or red bean, can be found in Mexico and the American Southwest. The seeds of this plant were basic to a 'vision-seeking cult'. They contain the alkaloid cytisine which is common in a number of this family's species. It can cause hallucinations, along with nausea, convulsions, even death by respiratory failure if taken in too large a dose. Other twenty-five species of Sophora contain this alkaloid, but it is only Sophora secundiflora which seems to have been utilised as a narcotic. There is evidence for the possible use of Sophora secundiflora as far back as 7500 B.C. From at least twelve sites, in caves and rock shelters in southwestern Texas, finds of Sophora beans have been recorded with dates ranging from between 7500 B.C. to A.D. 200. However, their presence alone does not indicate their use (Schultes in Furst 1972:). Later evidence suggests their usage for medicinal and narcotic purposes. In 1539, Cabeza de Vaca, a Spanish explorer mentions mescal beans as an article of trade among the Indians. In 1820, the Stephen Long Expedition reported the Arapaho and Iowa using large red beans as a medicine and narcotic. As Schultes (in Furst 1972) points out "a well developed mescal bean cult was known among the Apache, Comanche, Delaware, Iowa, Kansa, Omaha, Oto, Osage, Pawnee, Ponca, Tonkawa, and Wichita" . Many similarities have been noticed between the ceremonies of the Peyote and Red Bean Cults, and it appears that the Peyote eventually replaced the Red Bean because of its less toxic nature. The Red Bean remains in a token form as decoration for leggings and necklace in the Plains tribes of the Kiowa and Comanche. It is also reported that the Comanche, Oto and Tonkawa mixed the peyote and mescal beans to form a narcotic drink. Mescal or Red Bean cult of northern Mexico involving the seeds of the Sophora secundiflora shrub, was perhaps as old as 6/7,000 years. This is implied by archaeological evidence found in caves in Texas. These same rock shelters also contain numerous esoteric polychrome paintings of considerable complexity, which Newcomb (1967:65-80, in Furst 1972) attributes to shamans who depicted their hallucinogenic trance experiences. Including Datura, Latua and Methysticodendron. Datura is one of the most widely employed hallucinogens, used in both hemispheres and occurring in North, Central and South America. It is known to have been used by the Chibcha of Colombia and the Incas also used Datura as an intoxicant. It is still important in America today, from Colombia to Chile, along the Pacific Coast of northern South America and in certain parts of the Amazon. Banisteriopsis Caapi is transformed into an intoxicating drink which is called by many names, including yaj� or yag� as it is called in the Amazon region. The Eastern Tukano of the Vaup�s call it caapi, gahpi or kahpi; the Cubeo call it mihi; the Guahibo call it kopi; the Noanami call it dopa; and the Embera call it pilda. In Peru and Ecuador it is known as ayahuasca. This difference in nomenclature illustrates the problems encountered when attempting to study such plants on a more general level. The literature uses different words for the same thing and it is often difficult to keep abreast of which name is referring to which plant. It is also confusing, because these terms are often generic ones used by the Indians to describe any hallucinogenic plant. "Almost immediately when I closed my eyes I had visions of a multitude of intricate motifs of marked bilateral symmetry in spectacular colours passing slowly in oblique bands across my field of vision. The visions continued, modifying themselves, for more than twenty minutes, disappearing only briefly on two occasions" . All the visions described above (see chapters III, pp.28-45 and V, p.68-78) which deal with the controlled studies of phosphenes and hallucinations and the visions of other narcotically orientated societies. The visions described above, appear to follow the same pattern. At the time of the Conquest one of the most important hallucinogens amongst the Mexican Indians was ololiuqui. This is a small, round, lentil-like seed of a vine with cordate leaves known in the Nahuatl language as coaxihuitl, or 'snake plant'. It contains Lysergic Acid derivatives, but the use of ololiuqui was forced into the hinterlands by the Missionary movement. Ololiuqui is represented in murals at Teotihuac�n and at other sites including the 'Paradise of Tlaloc' mural at Tepantitla (A.D. 400-500?). It also occurs on painted pottery vessels of the Teotihuac�n civilisation. Until recently it was not known that mints were used in the New World for their hallucinogenic effects. It was Wasson (1962, in Furst 1972) who reported that Salvia was being employed by the Mazatec Indians of Oaxaca. Because of its use by shamans and curers practising divination this new species was named Salvia divinorum. The effects of this plant resemble those of the mushroom but are of shorter duration and not so striking. Schultes (in Furst 1972) noted that, when the juice of sixty-eight leaves were ingested the effects were characterised by kaleidoscopic movement and three-dimensional designs. The Mazatec Indians intentionally plant Salvia, usually in isolated mountain ravines. Interestingly, Salvia divinorum does not flower or produce seeds, this might indicate that it is a cultigen of considerable age. This type may also represent the Aztec narcotic known by the Nahuatl name pipilzintzintli. It appears that, in Oaxaca, Salvia was only utilised if the supplies of mushrooms and Morning-glory ran short. Perhaps this is because so much of it is needed and the effects last a shorter time and are less impressive. A study by von Gernet and Timmins (1987) links the the use of hallucinogens, pipe-smoking ceremonies and shamanistic practices. At the Calvert site, an Early Iroquoian village in south-western Ontario, the bones of the now extinct Carolina parakeet were found in association with the unusual finds of a stone pipe bowl, a slate tool and an antler artefact. The shamanistic practices of the Iroquoians is well documented due in part to the fact that it continued well into the historic period. An unusual aspect of the bird bone find is that the whole skeleton is not represented but three bones only, one each from the tail, head and wing. This find was also of great ornithological interest, as only 16 skeletons of this species have ever been found worldwide (Hahn 1963). The unusual nature of this find, combined with the exceptionally rare find of a stone pipe in an early Iroquoian context, and the result is an extraordinary combination. Von Gernet (1985) "has established the Amerindians of the Northeast smoked a variety of entheogens (mind-altering plant substances) presumably to produce altered states of consciousness and enhance visionary experiences . It appears to be the case that the native tobacco, Nicotiana rustica, when combined with fasting, is capable of producing altered states of consciousness, and von Gernet and Timmins would argue for its inclusion in the list of New World hallucinogens (von Gernet and Timmins 1987:38). According to von Gernet and Timmins, the tobacco-bird link is strong throughout the Americas; in turn this is linked to the trance state which accompanies shamanistic rituals. There are other species of plant which possess hallucinogenic effects, which are obviously too numerous to mention in detail in an account such as this. Some produce only auditory hallucinations and are therefore of no great interest here. Other effects are minimal. However, instead of ignoring them I have chosen to include them as an Appendix where they are listed with their botanical and common names and where known, their alkaloidal properties. The array of narcotic plants is substantial. It would appear that there is one species or another which would be supported by any climate. The evidence to support their usage, for whatever purpose, is evident in an abundant form beginning in the Neolithic at the latest. However, one is faced with the question: "If they appeared on a site, can we assume they were being used for their psychoactive properties and not for some other purpose?" The evidence of 'Mushroom Stones' and 'Parakeet Pipes', not to mention the braziers put forward by Sherratt, would certainly indicate a knowledge of the properties of such substances. The opium poppy thrives in most geographical environments, except those which suffer extremes of temperature. The evidence cited indicates the presence of opium on Neolithic sites in Switzerland, Germany, Spain, Poland and southern Britain. Written references to opium are present in Egyptian, Assyrian, Greek and Roman texts. The case for Cannabis is similar to that of opium. It can grow in many different climates. However, it requires hot conditions to produce substantial amounts of resin. Once again, finds from the Neolithic period come from Germany, Switzerland, Austria, Great Britain and Siberia. Iron Age finds have supported the theory of its usage from China to Europe during this period. Textual references to Cannabis are known from China, the Mediterranean, Arabia, Asia Minor, India, Africa, Europe and Mexico. Emboden goes as far as to say that Cannabis was one of the most important cultigens during the Bronze Age and the Iron Age. Fungi, according to Brothwell and Brothwell (1969:85), "occur in all kinds of places and at almost all times of the year" . This would indicate that their availability is not in question. The use of their narcotic properties is suggested by the occurrence of 'Mushroom stones' in early Mexican contexts. The Peyote Cult, gives a strong indication of the use of the Peyote Cactus, and it is thought that its usage was practised as far back as the Toltecs of South America. Though its geographical preference would have been limited, it would perhaps have been abundant in the New World. The Americas have provided an abundant source of hallucinogenic substances. The Mescal bean, which played an important part in the Red Bean Cult; Datura, a source of intoxication to the Incas of Peru and the Chibcha of Colombia; Banisteriopsis caapi, utilised by the Tukano, the Cubeo, the Guahibo and the Noanama of the Americas among others. Morning-glory was an important hallucinogen at the time of the Conquest. The Mazatec Indians of Oaxaca made use of Salvia, a form of mint, whose effects are similar to those of hallucinogenic mushrooms. Certain forms of tobacco have an intoxicating effect when taken on their own or with other substances. "the intoxicant effect of alcohol must have been known as long as fermented liquors have been known, and that in turn is probable just as long as man has been making starchy gruels and sugary beverages" (Dimbleby 1967:70). When one has considered the vast array of evidence for the varied geographical locales of such plants; their estimated abundance during prehistory; the evidence of their use in ritual contexts, both past and present; it would be difficult for one to ignore the strong possibility that populations during the Upper Palaeolithic and beyond were practising drug-taking, in order to attain altered states of consciousness. Whether this usage was part of a shamanistic ritual is more debatable but the possibility exists nonetheless, and evidence in support of this theory will be addressed in the next chapter. Copyright � 1995, Suzanne Carr. All Rights Reserved.